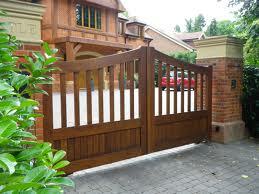 Treat yourself to professional gate repair in The Woodlands. We know gates, and we know how to repair them. We’ve put our skills to good use for our customers over the years, and we would love nothing more than to do the very same thing for you. There are two main types of gates, swing gates, and sliding gates. We can repair either one with the same level of professional skill. We are Garage Door Repair The Woodlands, but don’t let the name fool you. We do much more than provide professional garage door services. Gates are just as important as garage doors, and we are equally skilled in the repair, replacement, installation, and maintenance of either one. If you are satisfied when we’re finished, that means we did a great job, and we mean to do a great job each and every time. If your gate isn’t working quite right, or at all, it’s time for gate repair specialists to have a look. That’s where we come into the picture. We provide repairs for any gate system, and we can guarantee success. Our gate repair service is fast, efficient, and professional. For the price, you simply cannot go wrong. We can also provide automatic gate repair for those of you who need it. Just give us a call and we’ll gather some basic information about your automatic gate. We can then better prepare for our trip to your property. We want to make sure we bring anything we might need in order to carry our repairs for you. In addition, we provide professional gate opener repair. Gate openers power the gate and allow them to open and close. This makes them the single most crucial component to any gate system. Let us repair your opener if it isn’t working right, and we’ll get it fixed and working in no time. When you call on our skills for gate installation, you get the reliance of knowing that we are qualified and experienced. We make good use of skilled hands to provide the precision needed to install a gate system. We want it to be secure and sturdy, and we’ll work hard to make sure that is the case. When you need a professional gate contractor in The Woodlands, give us a call. You won’t be disappointed!